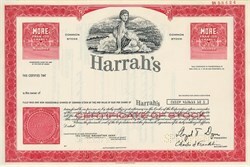 Beautiful engraved RARE specimen certificate from Harrah's dated in 1978. This historic document was printed by Federated Banknote Company and has an ornate border around it with a vignette of an allegorical woman. This item has the printed signatures of the Company's President and Secretary and is over 35 years old. This is the first time we have had this for sale. Harrah's Entertainment, Inc. is a gaming corporation that owns and operates casinos, hotels, and five golf courses under several brands. The company, based in Las Vegas, Nevada, is the largest gaming company in the world, with yearly revenues around $7.11 billion. On December 19, 2006, the company's board of directors voted to accept a buyout offer from Apollo Management and Texas Pacific Group for $17 billion, or $90-per-share. The company known as Harrah's Entertainment was founded on October 30, 1937 as a small bingo parlor in Reno, Nevada operated by William F. Harrah. 1937: Bill Harrah opens his first bingo parlor in Reno. 1946: Bill Harrah opens Harrah's Club in downtown Reno. 1955-56: Harrah's purchases several clubs at Lake Tahoe. 1962: Harrah's constructs 400-room hotel tower in Reno. 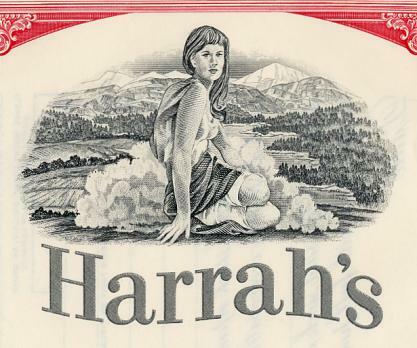 1971: Harrah's begins public trading with issue of 450,000 over-the-counter shares. 1972: Harrah's is listed on the American Stock Exchange. 1973: Harrah's becomes first gaming company listed on the New York Stock Exchange. February 1980: Holiday Inn acquires Harrah's. Holiday Inn has 1,600 hotels and interests in two casinos: one under construction in Atlantic City and a 40 percent ownership interest in River Boat Casino, a casino adjacent to the Holiday Inn hotel on the Strip. January 1983: Holiday Inn acquires the remaining 60 percent interest in River Boat Casino. Harrah's assumes management of the casino and hotel. May 1985: Holiday Inn shareholders approved a new corporate name, Holiday Corp., which operates several products: Harrah's Casinos, Holiday Inn hotels, Embassy Suites hotels and Hampton Inn hotels. August 1988: Harrah's Laughlin opens. August 1989: Holiday Corp. board approves acquisition of the Holiday Inn hotel business by Bass PLC. January 1990: Holiday stockholders approve transfer of Holiday Inn hotel business to Bass PLC and spin-off of the remaining brands (Harrah's, Embassy Suites, Hampton Inn, Homewood Suites) into The Promus Companies. February 1990: Promus Companies common stock begins trading on the New York Stock Exchange under the ticker symbol PRI. February 1991: Phil Satre named president and chief operating officer of Promus. April 1992: Conversion of Holiday Casino in Las Vegas to Harrah's Las Vegas completed. May 1993: Harrah's Joliet opens. November 1993: Harrah's Vicksburg and Harrah's Tunica open. April 1994: Harrah's Shreveport opens. April 1994: Phil Satre named Promus chief executive officer. September 1994: Harrah's North Kansas City opens. December 1994: Harrah's Ak-Chin casino opens near Phoenix, marking the first Indian gaming operation for Harrah's. June 1995: Promus Companies spin off the hotel brands into a new corporation, Harrah's Entertainment, returning the name to the New York Stock Exchange for the first time since 1980. Harrah's stock symbol is HET. September 1997: Harrah's launches Total Gold, the industry's first fully integrated national player rewards and recognition program. October 1997: A $200 million expansion of Harrah's Las Vegas is completed. June 1998: Harrah's completes a $1 billion acquisition of Showboat Inc., giving Harrah's four additional properties. Harrah's later sells Showboat's Las Vegas and Australia properties. January 1999: Harrah's purchases the Rio. January 2000: Harrah's signs letter of intent to develop and operate a casino and hotel in San Diego County, the first agreement reached between a California Indian tribe and a major gaming company. March 2000: Harrah's completes its $439 million purchase of Players International. July 2001: Harrah's completes a $712 million purchase of Harveys Casino Resorts. The purchase adds four properties to the Harrah's including Harveys Lake Tahoe. August 2002: The $125 million Harrah's Rincon opens San Diego. December 2002: Harrah's completes its acquisition of JCC Holding, the owner of Harrah's New Orleans. January 2003: Gary Loveman becomes chief executive officer of Harrah's, succeeding Phil Satre who retires after 10 years as CEO. April 2004: Harrah's and MTR Gaming Group reopen Binion's Horseshoe, three months after the legendary downtown casino was forced to close. MTR owns the property, but Harrah's will operate the Horseshoe for at least one year. As part of the deal, Harrah's acquires the rights to the World Series of Poker. May 2004: The first World Series of Poker under Harrah's is completed with more than $41 million in prize money awarded, nearly double the amount awarded in 2003. July 2004: Harrah's completes its $1.45 billion acquisition of Horseshoe Gaming, giving Harrah's control of three Midwest Horseshoe casinos. July 2004: Harrah's reaches a definitive agreement to acquire Caesars Entertainment for $9.4 billion. October 2004: Phil Satre announces his retirement as Harrah's chairman; he is replaced by Gary Loveman. June 13, 2005: Harrah's buyout of Caesars closes. Caesars Entertainment Corporation is the world's most geographically diversified casino-entertainment company. Since its beginning in Reno, Nevada, more than 75 years ago, Caesars has grown through development of new resorts, expansions and acquisitions, and now operates casinos on four continents. The company's resorts operate primarily under the Harrah's�, Caesars� and Horseshoe� brand names. Caesars also owns the London Clubs International family of casinos. Caesars Entertainment is focused on building loyalty and value with its guests through a unique combination of great service, excellent products, unsurpassed distribution, operational excellence and technology leadership. Caesars is committed to environmental sustainability and energy conservation and recognizes the importance of being a responsible steward of the environment.